Kenton's Infotainment Scan: An entire meal for $10 at Walgreens?! Sign me up! This is one of the best sales promotions I've seen in a long time. 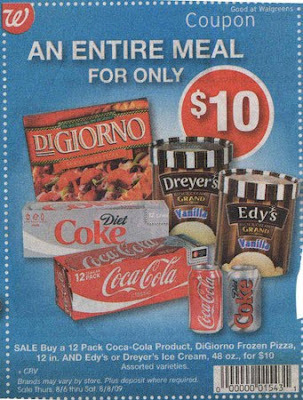 Clipped out of a flyer in the Minneapolis Star-Tribune, Walgreens promises us "an entire meal for only $10." If you actually consider this to be a meal, you likely won't make it to Walgreens. Health concerns trump cost savings - I mean, it's an entire meal for only $10! Better speed up that health-care reform, Obama: these meals are selling like frozen pizzas, Cokes, buckets of ice cream, and hotcakes. That's the meal you would have as a 15 year old when your parents went to the lake for the weekend and left you 20 bucks for food. But thanks to this coupon you would still have 10 bucks to ride the bus down to Magicland and play Operation Wolf for a few hours with a giant stack of quarters! Awesome! That would be pretty sweet.